Nori K. asks: Where did the phrase red herring come from? Meaning a distraction or false trail, the expression “red herring” has been relatively commonly used for the last two centuries, and its origins do, in fact, begin with a rust-colored fish. However, until quite recently, the accepted origins of red herring were themselves a false trail. 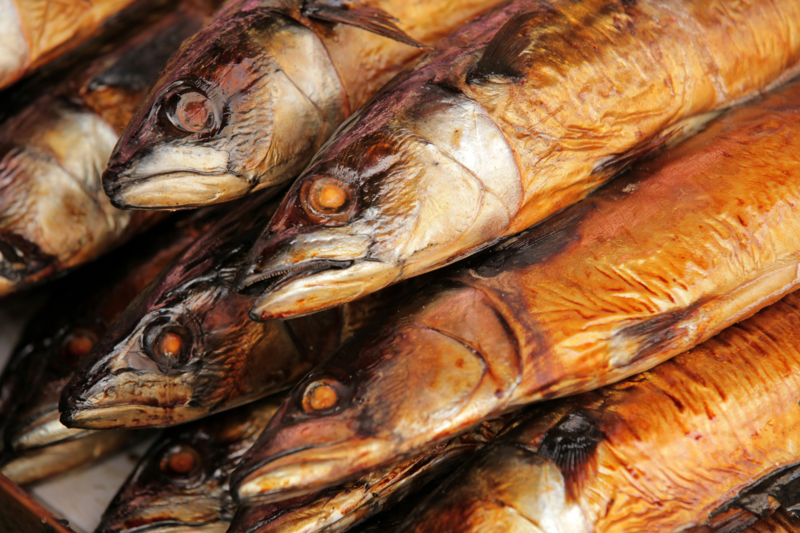 The literal sense of a red herring dates to at least 1250 AD when Walter of Bibbesworth wrote in The Treatise, “He etep no ffyssh But Heryng red.” A product of the process used to preserve the fish into a kipper, the herring is cured in salt brine and then smoked for up to 10 days. If enough brine is used, the fish turns a red, coppery color with a rather strong smell. Capable of being stored for long periods of time, this dried kipper was inedible until after it was first soaked in water to remove the salt, and then it could be warmed and eaten. A staple in English society, particularly among the poor, there would have been a fair amount of tough, dried red herring hanging about. And, given that they had a strong smell, it makes sense that their aroma would attract animals. Accordingly, in 1697, Nicholas Cox described just such a use in The Gentleman’s Recreation, where a red herring was supposedly dragged along a route to get a young puppy to learn to follow a trail. Others expounded upon Cox’s idea and said that later in the training, while following a fox or badger, a red herring would be dragged perpendicular across the animal’s path to confuse the dog at first, but ultimately lead to a dog that could stick to an original scent as opposed to a compelling, intervening scent. This explanation was, for many years, accepted as the origin of using red herring to mean a false trail. But, as previously noted, this explanation is actually a red herring as Cox’s initial description was based on mistranslation of a book on horse training by Gerland Langbaine (also published in 1697). In the book, Langbaine recommended using a dead cat or fox for dogs to track and horses to in turn be trained to follow, with the red herring used to draw the dogs if cat or fox was not available. In this case, there was no deception happening, as would later be stated to support the notion that this is where the expression came from, and it wasn’t the dogs being trained, as Cox would himself state. This red herring was only revealed recently, in a pair of articles published in Comments on Etymology in 2008, along with what is now accepted as the actual origin of our use of the phrase red herring. Despite this early instance, the expression didn’t ultimately became part of common vernacular until after Cobbett reprinted an “extended repetition of it in 1833,” and then his son included it in the commentary of a later edition of William Cobbett’s Rural Rides in 1853. What is the origin of red herring to mean a diversion or false trail? Where does the phrase red herring come from? I was reading the Vintage News a couple of days ago and they came up with these explanations. I knew about William Cobbett, but hadn’t heard about Harper Mayne. William Cobbett as a prime suspect in making the phrase famous. ment member, and a fiery supporter of the agricultural reformation near the end of the 18th century, Cobbett decided to take action himself against what he saw as general laziness and stupidity of the other journalists. Always a dissident to the establishment, he added some color (most likely red) to the rants and criticism. He wrote a column in 1807 about trailing a red herring on the ground to mislead hounds on the hunt. William Cobbett (left foreground), John Gully (middle), and Joseph Pease (right) (the first Quaker elected to Parliament) arriving at Westminster, in March 1833. Sketch by John Doyle. The pungent scent would easily draw away hounds from the real trail. Those metaphors were trying to show the way journalists were easily misled from the crucial and more important aspects of political journalism. The story easily caught on. Quaker guns (logs used as ruses to imitate warfare cannons) in former Confederate fortifications at Manassas Junction March 1862. It is a commonly used deception tactic during the 18th and 19th centuries. Still, it is widely accepted that Cobbett merely popularized the phrase, rather than being a progenitor. Ironically, there is another, less accepted theory that might be the true origin of the red herring A rich clergyman from Oxford who went by the name of Jasper Mayne died in 1672. His will said that Mayne left a large sum of money in a coffer for the renovation of St. Paul’s Cathedral, and something for the poor and needy as well. Mayne’s will led his servants to the bequest’s exact location. To nobody’s surprise, the coffer was full of salted herring, a clergyman’s honorable legacy. One can only imagine the anticlimax and the servants’ disappointment. Even though Cobbett’s red herring origin story is the more popular one, Mayne’s story fully checks out. In contrast to Cobbett’s ambiguous context of hunting, Mayne’s red herring offers a deliberate idea of misdirection, much to the dismay of his servants. But one thing is certain, one or the other is a misleading clue in the quest to point out the amusing origin of the phrase.